It’s always difficult for schools who advance deep into the football playoffs to turn around, with short practice time, and open the basketball season successfully. Buoyed by stout defense and balanced scoring, Boone Central/Newman Grove was able to do just that this past weekend, scoring victories over Hartington Cedar Catholic and Lakeview. 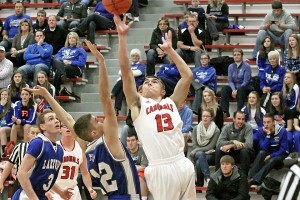 In the season tip-off at Hartington Friday, the Cardinals were able to overcome a sluggish offensive start with a strong second half that drove a 52-45 victory. After trailing at halftime, it was the Cardinals and their defense that carried the day. Boone Central/Newman Grove had a much easier time Saturday in its home debut, blasting Lakeview 53-24 after a fast start. The Cardinals held Lakeview to just four points in each of the first two quarters and built a 29-8 halftime lead. “Back to back nights the first week can be interesting,” Zoucha said. “We were able to put a lot of pressure on Lakeview, which caused 20-plus turnovers. That effort on defense gave us opportunities to score. We rebounded better and communicated better defensively.